Gibson dedicated this iconic Explorer Signature electric guitar to Sammy Hagar who rocked endless stages for decades. The Red Rocker Explorer has solid mahogany body and neck, a rosewood fingerboard and two uncovered zebra pickups which work so well in our opinion. The '57 Classic in the neck position is warm and bluesy while the BurstBucker 3 in the Bridge is a rock machine. While being a really versatile axe, due to its somewhat out-there appearance this instrument might not be everyone's choice. 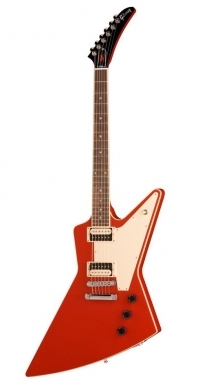 But if you are a collector, or if the colour red does not scare, take a spin on the Gibson Explorer Sammy Hagar Red Rocker Signature. Expect the search to be a little hard though, as only 250 of them were made.